The role of the International Monitoring Operation (ONM) in the judicial reform has been pernicious from the beginning. The initial debates, in 2016, between Rama’s majority and the opposition during the drafting of the main legislative package that enshrined the judicial reform into the Constitution, showed that there was no consensus to give the International Monitoring Operation, comprising international legal experts, any authority to offer binding judgments in the vetting process. In the name of the sovereignty of Albania, the ONM was given only an advisory role, which was enshrined in article B of the Annex to the Constitution. In February 2017, ONM chair Genoveva Ruiz Calavera suddenly announced that the ONM would have a “Managing Board,” consisting of herself, EU Ambassador Romana Vlahutin, and US Ambassador Donald Lu. As such a board was not regulated in the Constitution and would seem to politicize the ONM, the then Minister of Justice Petrit Vasili publicly critized Ruiz Calavera. The EU Commissioner for Enlargement Johannes Hahn was forced to intervene, arguing that the Managing Board was “implied” by the Constitution. On her part, Ruiz Calavera argued that the Managing Board was of a “purely administrative nature.” From a constitutional perspective, neither of the two arguments were, of course, convincing. This incident gave a first taste of the troubled relation that the ONM would develop with the Albanian political establishment. In the end, its success did not hinge on the professionalism of the actual experts; their advice was not legally binding. It was therefore up to the Board – Ruiz Calavera, Romana Vlahutin, and Donald Lu – to defend ONM’s integrity and make sure it wouldn’t slide into complete irrelevance. Unfortunately, now that both Vlahutin and Lu have come out openly supporting the government in more than one political controversy, praying for a quick win just before the end of their term, the independence of the ONM has been “sold for scrap,” as the Prime Minister would say. This became clear when Speaker of Parliament Gramoz Ruçi, ignoring the ONM and in violation of the Constitution, sent back the recommendations of the ONM concerning the applicants for the vetting institutions to country’s Ombudsman, demanding the application process be reopened. The ONM’s Managing Board failed to respond. Its newly acquired passivity became especially apparent in its response to the way in which the government dealt with election of the members of the High Prosecutorial Council (KLP) and the High Judicial Council (KLGj). First, the parliamentary ad-hoc committee, following the recommendation of parliament’s Secretary General Genci Gjonçaj, qualified two candidates who had received a negative recommendation by the ONM, while, at the same time, it disqualified one candidate who, not only had received a positive recommendation, but was also ranked as the best candidate by the committee that had proposed the nominations. In parliament, as no consensus could be reached between parties, all KLP and KLGj members were drawn by lottery, and later confirmed by default as the necessary majority was not reached after three rounds of voting. The law sets formal conditions and/or minimum requirements for the selection of the lay members to the council, but leaves a certain level of discretion in the interpretation. The IMO [ONM] and the Secretary General of the Assembly, within their own framework of independence and responsibility, have evaluated differently the minimum requirements related to three cases. IMO has duly noted the views by the Secretary General of the Assembly, who remitted the decision to the Assembly, as last appointing institution. Failure to agree by the Parliament led to the automatic adoption of a final short list drawn by lottery, in accordance with the de-blocking mechanisms established in the law. Although the Commission would have preferred that the Secretary General of the Assembly be fully endorsed the IMO recommendation, we have no ground to contest the legality of the exercise, since the law itself can lead to different interpretations. Although the ONM may have no legal “ground to contest the legality of the exercise,” this would have been the perfect moment for its political armor, the Managing Board, to stress the importance of the ONM to the impartiality and consensus of the judicial reform. Ambassadors Lu and Vlahutin remained, however, dead silent. The European Commission is currently drafting the Albania’s report 2018, reviewing progress in all relevant policy areas. No comment can be made at this stage on the ongoing assessment. In other words, when the European Commission will present its findings on the progress of the implementation of the judicial reform – one of the five key areas – it will make no mention of the way in which this judicial reform is actually being implemented. This would be of course a shocking misrepresentation of the facts, because in fact the Albanian government ignores the advice of the international mission that was supposed to guarantee the reform! More recently, the ONM filed a complaint against Public Commissioner Heral Saraçi. Last Monday, Saraçi was convicted by an ad-hoc Disciplinary Commission comprising members of the Appeals College for “obstructing” the vetting process and was removed from his position. Saraçi claimed that he was not told which law he had exactly violated and on which basis he was relieved of his function, blaming the “legal vacuum” surrounding the office of Public Commissioner. Now of all complaints that the ONM could have made, why this one? Why didn’t it speak out against Gramoz Ruçi when he violated the Constitution and meddled with the nomination of the vetting institutions? Why didn’t it speak out against Genci Gjonçaj, when he fully disregarded its recommendations and gave unqualified imposters a pass? Why didn’t it clarify its interpretation of the Constitution, by which the ONM is bound (including whatever is “implied” by it, following Hahn)? Instead, the ONM chose a target without political allies: a Public Commissioner. It chose the weakest target that could do the least damage to the vetting process: substitutes were waiting behind the scene to take over from Saraçi, and no politician would come to his aid – afraid to publicly “intervene” in the “impartial” vetting process. 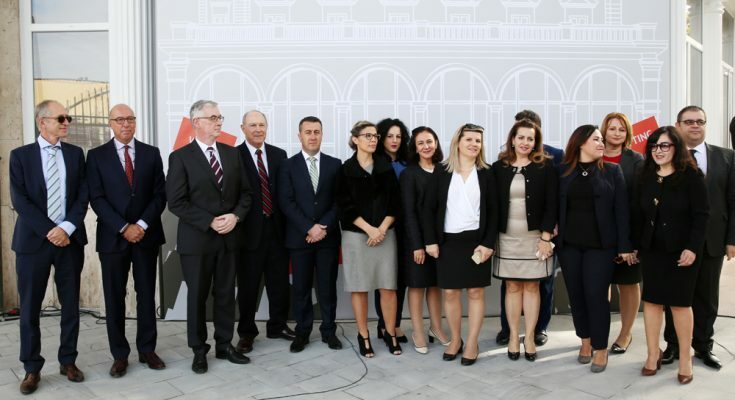 With this action, the “purely administrative” Managing Board of the ONM has given off a clear signal to the Albanian political elite: we do not care about the conditions in which we are supposed to do our work. We do not care about the rule of law framework in which we operate. We only care about the little people in the little vetting building, working through their little dossiers, vetting little judges and little prosecutors according to our little articles in the Constitution, interpreted within the littlest framework of our tiniest imagination. We won’t touch you, our big friends. Please, please, don’t touch us – let us leave this country in peace!